Inky is just simply the prettiest little thing. She is so tiny and delicate but perfectly proportioned with a delightful personality. Whilst she is initially shy and cautious of new people and places she has an underlying desire to explore, play and seek attention that gradually appear as her confidence and trust grows. For the most part Inky is a gentle, reserved kitty but she simply can’t resist play time! When her toys come out so does her cheeky, devil may care attitude. She is incredibly acrobatic and energetic and it’s great fun watching her revel in these games. She is not a lap cat yet and prefers not to be picked up for long periods but she is improving. She does show a lot of fondness for having her chin or behind her ears and neck scratched. She also enjoys gentle stroking and body massages. If she feels overwhelmed by the attention she will leave but often cant resist coming back for more attention once she realises she is not being forced to stay. She shows a genuine desire to interact with people and given time her loving nature will blossom to its full potential. 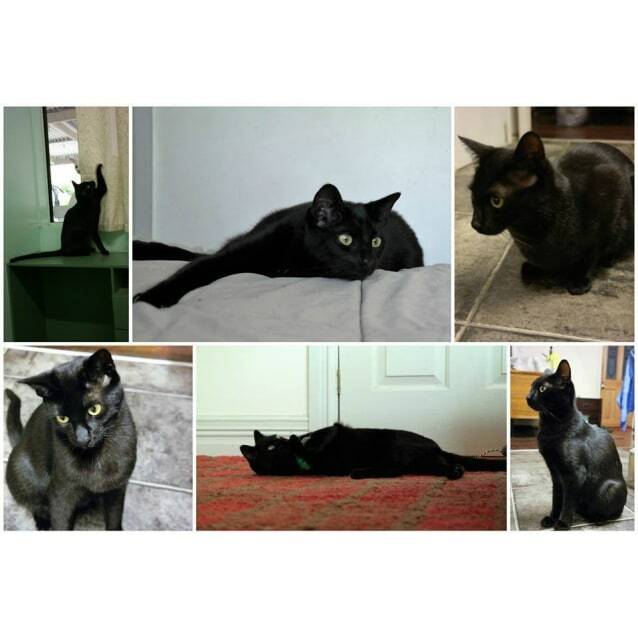 Inky is currently living with three large dogs and three cats (including Pepper and her brother Smudge who are both also available for adoption). She gets along beautifully with all the dogs, even if they race right past her down the hallway she calmly sits and watches them go by. She is sweet natured and gets along with the other cats, often curling up to sleep with either Pepper or Smudge. She would suit a home with patience and understanding to allow her to develop at her own speed. She does well in her current chaotic foster home so she would probably adapt to most environments in her own time with gentle guidance. Inky loves her food and has a good appetite for a little girl. Inky also loves her kitty friends. She loves being able to watch and observe what you are doing. Her main dislike is feeling forced or coerced into doing anything. Her very favourite thing above all else is playing! Once you have been in contact with the adoption co-ordinator we will forward an application form to you.